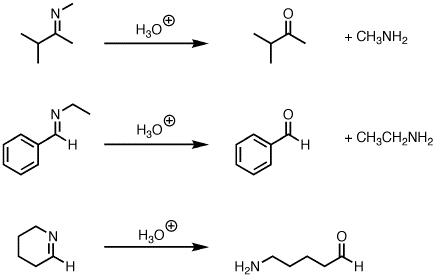 Description: Treatment of imines with water leads to their hydrolysis back to aldehydes (or ketones) and an amine. Notes: The reaction is assisted through the use of an acid catalyst. Notes: Note that the third example is intramolecular. 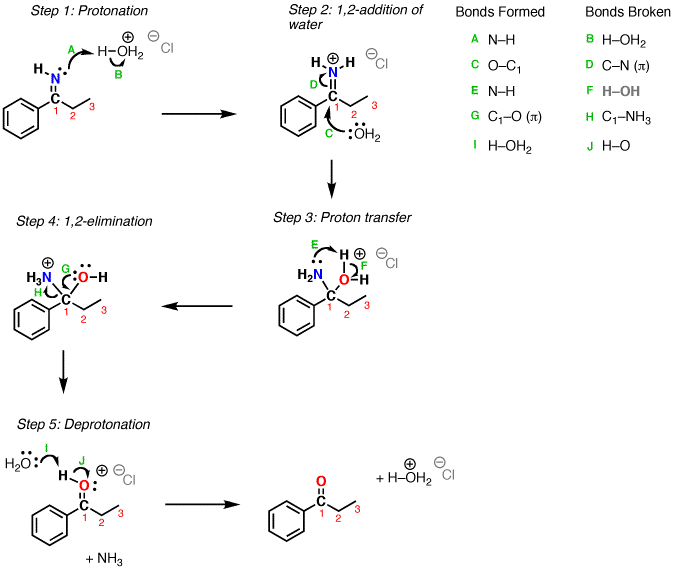 Mechanism: Protonation of the imine nitrogen (Step 1, arrows A and B) results in the formation of the iminium ion, which undergoes 1,2-addition by water (Step 2, arrows C and D). Transfer of a proton (Step 3, arrows E and F) followed by 1,2 elimination of ammonia (Step 4, arrows G and H) lead to an oxonium ion, which is then deprotonated to give the neutral ketone. Acid is helpful but not an absolute requirement for this reaction. Reasonable mechanisms can be drawn without acid. The “Cl” here in H3O+ Cl- is completely unimportant, just meant to show a balance of charge for H3O+. Other counter ions such as Br-, HSO3-, etc. would work just as well. Note that this is an equilibrium reaction and goes in this direction because of the large excess of water. It is the exact reverse of imine formation. There are certainly other reasonable ways to draw proton transfer (Step 3) and other species besides H2O that could conceivably act as bases in the last step. Great outline! Excellent helping me right before my exam! Great review, but I’m a little confused as to where the fifth carbon went on the intramolecular imine hydrolysis under examples? It’s a typo. Fixed – thanks for spotting it! Just one thing I’m still confused about… why can’t step 5 happen before step 4? Wouldn’t it be more favorable to deprotonate the oxygen first and then have the lone pair kick down and get rid of LG? This is done under slightly acidic conditions. I’m not sure if this question belongs in this topic. But I’m just wondering is an iminium ion a stronger electrophile than an oxonium ion? It is in the Strecker synthesis, but I don’t exactly understand why. is it possible to get imine from cyanide by making the use of grignard reagent? Yes, but isolating the imine is not always very easy. I don’t quite get it. Isn’t H2O a better leaving group then NH3 or in other words, isn’t the latter a better nucleophile? Why does then reaction proceed towards the ketone? Just because water is in excess? Yes – the reaction is in equilibrium, but the high concentration of H2O pushes the reaction toward the hydrolysis product. Thank you for your fast reply. Let me just say that this site is exceptionally educational and helpful! I want to transfer carvone semicarbazone (an imine of carvone) back to carvone using this reaction. Which concentrations are suitable to do this? Is it reasonable to use 0,1 M HCl for example? In other words: at wich pH has the reaction maxiumum efficiency? Thanks for the nice illustration. My query is after removal of water is the resultant imine air stable? Air stable? Absolutely. However in the presence of water it will hydrolyze. Very very clearcut and nice explanation with mechanism……….Loved it!!!! Is the imine or ketone more thermodynamically stable? It would be nice to know when I am pushing more or less uphill against the thermodynamically favored molecule. In my lecture, I was given a reaction of 1,3-diketones with hydrazine to make pyrazoles (no acidic catalyst). Does this mean the excess of hydrazine is implied, or is it the aromaticity of the pyrazole driving the product in the absence of a catalyst? Imine vs Ketone thermodynamic stability uncertain but not particularly relevant, as reactions are controlled by excess anyways. In the formation of the imine, a drying agent or molecular sieve will remove water in the equilibrium as it builds up as side product. The reaction I supplied is called the Knorr pyrazole synthesis, and actually my lecturer just forgot to add an acidic catalyst (more likely assumed I should know it would be there!) Imines formed from hydrazine substitution are hydrazones. Imine hydrolysis is possible with base.. Which is better acid hydrolysis or base hydrolysis? Which will allow nitrogen to be a better leaving group, acidic or basic conditions? Is there another base hydrolysis of Imine mechanism? The nitrogen has to accept a proton at some point in order to become a good leaving group. It’s possible to use NaOH/H2O (i.e. mildly basic conditions) but still that relies on the solvent acting as a proton donor. If you’re referring to the mechanism, it would be exactly the same except your leaving group would be RNH2 instead of NH3. Hope that answers your question!